FICO (NYSE: FICO), formerly known as Fair Isaac, is a leading analytics software company, helping businesses in 90+ countries make better decisions that drive higher levels of growth, profitability and customer satisfaction. The company's groundbreaking use of Big Data and mathematical algorithms to predict consumer behavior has transformed entire industries. FICO provides analytics software and tools used across multiple industries to manage risk, fight fraud, build more profitable customer relationships, optimize operations and meet strict government regulations. Many of our products reach industry-wide adoption. These include the FICO® Score, the standard measure of consumer credit risk in the United States. 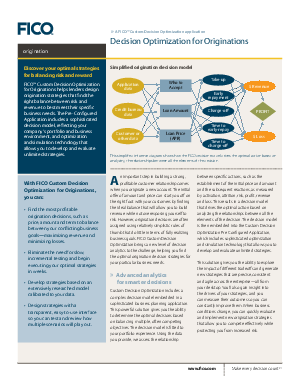 FICO solutions leverage open-source standards and cloud computing to maximize flexibility, speed deployment and reduce costs. The company also helps millions of people manage their personal credit health. FICO: Make every decision count™. Learn more at www.fico.com.